A biennial gathering of publishers, editors, writers, and thousands of booklovers, the Jerusalem International Book Fair hosts provocative seminars exploring issues vital not only to members of the publishing and media communities but to the creation of an enduring cultural legacy. 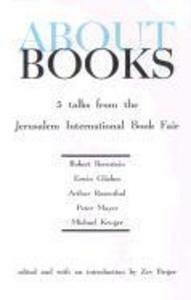 About Books brings together five keynote addresses from these seminars.Presenting a persuasive case for "the publisher as activist", Robert Bernstein recalls his own challenges to censorship in the U.S. and the repression of writers in the Soviet Union, China, and other nations to demonstrate the importance of safeguarding freedom of expression. Erwin Glikes offers a strong-minded look, with humor and heart, at the imagination, effort, and "relentless foolhardiness" editors must exert to publish books that make their mark. In a thought-provoking exploration of publishing's moral conscience, Arthur Rosenthal focuses on the publishing community's obligation to contribute to society by becoming involved in education and job opportunities. Peter Mayer, examining the dominance of American media internationally, takes the contrarian position that the real threat is to American culture itself, which has increasingly closed its doors to the influx of ideas from other cultures. Michael Kruger's defense of literature in a non-literary world reinvigorates the "old-fashioned" notion that reading heightens our sensibilities, educates us about both past and present, and stirs up "feelings of bliss" no other media can offer.